Page 45 is proud to present its first two exclusive cards commissioned to come FREE with our printed Page 45 Gift Vouchers  envelope included, obviously. 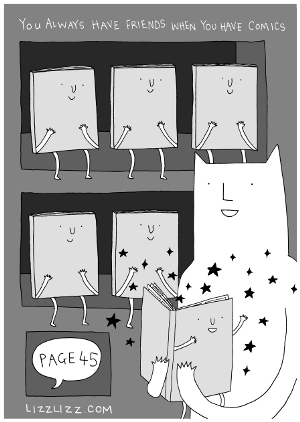 Lizz Lunney and Philippa Rice have represented the heart and soul of Page 45 to perfection. Look at the sheer, sparkly joy of this image in glorious grey tones! I defy you not to grin, such is the infectious enthusiasm of both the comics and cat. Is this DEPRESSED CAT? If so we have finally cured the moribund moggie  though I suspect the effect may be fleeting! But perhaps you dont want no gift vouchers today (though I assure you, you do!) so weve made these cards available for you to buy separately in order to celebrate your love of Lizz Lunney and frankly promote us to death! Yippee! N.B. If youre ordering printed gift vouchers online feel free to add a little note with the order as to which card youd prefer  you dont have to buy this as well!